I am delighted to be back in Vienna today to meet with Federal Chancellor Kern and other distinguished members of the Austrian government. We have reaffirmed the deep friendship between the OECD and Austria, and expressed our commitment to work together in this tough economic climate for the benefit of all Austrians. 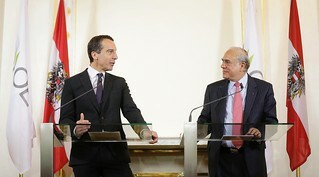 Vienna, Austria, 7 November 2016 - Christian Kern, Federal Chancellor of Austria (left) and Angel Gurría, OECD Secretary-General. The current global economic conditions are challenging for many of our countries, and not least Austria. The recent OECD Interim Economic Outlook presents a largely unchanged picture of anaemic world trade and global GDP growth remaining at a modest 3%. For 2017, we expect only slight improvements. It is clear that we are stuck in a low-growth trap of slow investment, trade, wage and productivity growth. Add to that the ongoing increase in inequality and no one should be surprised that public trust is so low! Given this context, Austria has fared rather well. Its well-functioning labour market, export-oriented economy and consensus-driven society has helped deliver high levels of well-being and growth. Austria continues to perform well in many dimensions of the OECD’s Better Life Index, including life satisfaction, jobs and earnings. Per capita income is one of the highest among OECD countries and the employment rate stood at 71% in 2014 versus 66% in the OECD. Further, income inequality and poverty rates are among the lowest in the OECD. However, Austria’s good performance has increasingly come under pressure. Austria’s overall position has weakened compared to the best performing OECD countries. GDP per capita growth has been flat, averaging at -0.1% between 2012 and 2015; total factor productivity has declined; and external competitiveness and export market shares have deteriorated. Although it is still low, unemployment is rising, at our last count it stood at just over 6%, compared to 4.6% at the beginning of 2012. Austria, like other OECD countries, needs urgently to break out of this low-growth trap. With monetary policy having become overburdened and creating risks, fiscal and structural policy actions are needed. And for greater impact, such action should be coordinated at the European level. Turning to our recommendations: firstly, a key policy tool to strengthen social inclusion and kick-start growth is public investment. Low interest rates have increased fiscal space and a collective increase in public investment spending could actually boost, rather than weaken, debt sustainability by lowering the debt-to-GDP ratio. At around 6%, Austria’s public investment share of government spending is currently below the 8.1% OECD average. Further, OECD simulations suggest that increasing Austria’s public investment ratio of 3%, towards the average ratio of the top half of OECD countries (4.3%) could boost Austria’s GDP by as much as 9% in the long run. The areas where we see the greatest benefits for higher public investment are digital infrastructure, long-term care and child care. Moreover, investment can also boost innovation and allow Austria to take full advantage of the digital revolution. This brings me to my second point. Austria performs well on certain OECD digital economy indicators, for example broadband is more affordable than on average in the EU. But in other areas, such as high-speed broadband connectivity, it lags behind. With only 1.6% fibre connections in total broadband, Austria scores well below the OECD average of 19.4%. But in order to enable everyone to participate equally in the digital economy, Austria should to at the same time boost people’s digital skills. A third important area for reform in Austria is improving education and skills. Despite strong levels of investment in education, outcomes are only average. In our last Programme for International Student Assessment (PISA), the mean performance of Austrian 15-year-olds was only slightly above the OECD average and below the level of other European countries including Germany, Switzerland, Belgium and Finland. To help enable people to acquire the skills they need to thrive, Austria needs to use its available education resources more effectively. This requires unifying the governance and funding for all levels of education and ending the formal divide between federal and provincial schools. I am happy that the government’s recent education reform proposal is enabling greater school autonomy in staffing choices – informed by our 2016 OECD Review of School Resources for Austria. Lastly, Austria needs to better harness the existing skills of its people. Austria has great scope to boost employment among women, low-skilled workers and immigrants. Alongside gender gaps in labour force participation and part-time work, the employment rate of the low-skilled, at 32%, is well below the average national employment rate of 57%. To fully reap the economic and social benefits of everyone’s talents, important changes include expanding day care capacity, further reducing the labour tax wedge and improving the recognition of foreign professional qualifications. Austria has made recent improvements in this area – including the 2016 tax reform and the recent economic reform package. The OECD is delighted to be helping Austria face these challenges. We have been working together on many fronts including education, skills strategies, mental health, the management of labour migration and risk governance, to name just a few. Let me take this opportunity to welcome the government’s vast reform efforts in the past weeks, most recently focusing on digital government and the Austrian Trade Act. Chancellor, you are becoming our champion reformer! We will continue this close and forward-looking cooperation. Remaining among the top-performers and at the leading edge of best practices requires a permanent commitment to reform. Austria has this mind-set. The OECD stands ready to continue supporting you across your reform efforts. Together, we can design, deliver and implement better policies for better lives in Austria.